Spaetzle is a German pasta-like side dish. 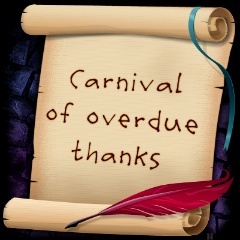 It is particularly delicious under cuts of meat that have savory gravy. It can also be served as a dairy dish, with melted cheese and/or butter. This is a large recipe. It makes enough for three meals. This recipe can be halved, but the ingredients aren't expensive, and it is easier to make this larger amount, stocking the freezer, and only cleaning the spaetzle maker once. With a spaetzle maker, it's quick and easy to make. 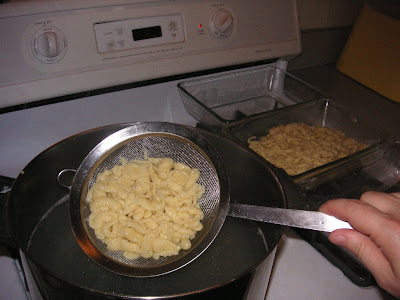 If you don't have a spaetzle maker, this can be done using a dripping spoon, or by forcing the batter through a wide-screened sieve. If you choose to do this without a spaetzle maker, it'll be possible, but messy. Set a stock pot half-full with water to boil. 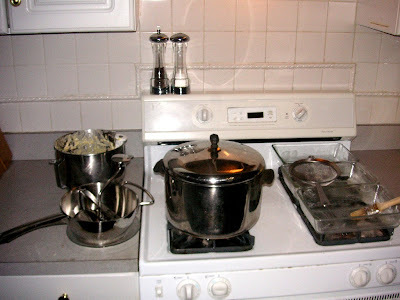 Set up stove top workspace with (for right-handed person) the spaetzle maker and a clean plate on the left hand side of the stock pot, and the strainer and destination containers on the right. Place a tablespoon (or two) of oil in the destination dishes. Place all dry ingredients in a mixing bowl and whisk them together. 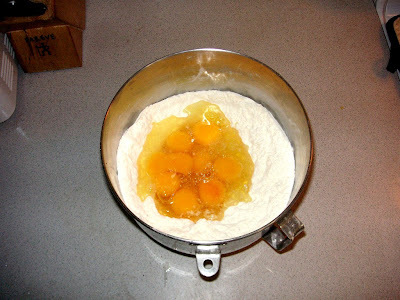 Make a well in the dry ingredients, and add the eggs to the well. Mix just until eggs are incorporated. Add 2 cups of water and mix until the water is incorporated. 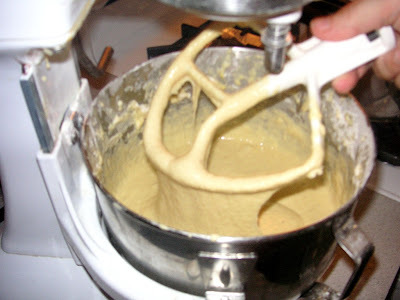 Continue to add water just until a wet, droopy batter is achieved. It should be cohesive enough to pull against the mixer beater, but wet enough to pull itself off of it. Grease the spaetzle maker (optional, but aids clean-up). Pour the batter into the spaetzle maker over the rapidly boiling water. 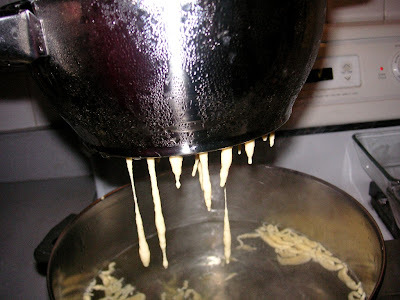 Turn the crank, forming drippy glops of batter under the spaetzle maker. The glops will drop in the boiling water. As the spaetzle rise to the top of the boiling water, use a strainer to collect them and place them in the destination dishes. Stir the spaetzle in the oil to keep them separate. Serve the spaetzle hot/warm. They freeze and reheat well. The batter goes together quickly, so it helps to get the water boiling and the straining-equipment set up before starting the batter. 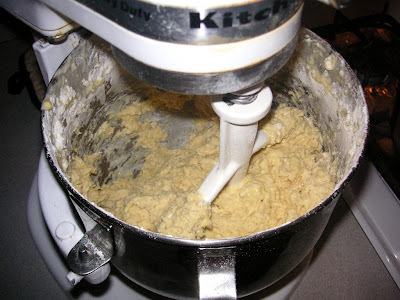 Making a well in the dry ingredients avoids lumps of flour in the batter. 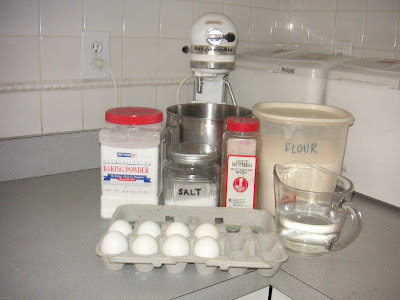 This is the eggs-and-dry-ingredients mixed, just before any of the water was added. This is after all the water was added. Try not to add too much water: add the complete 2 cups, but after that, add in tablespoons at a time, until the batter reaches this consistency. 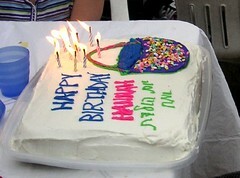 It should be a easily poured, but gloppy batter. The batter should start to drain out of the bottom of the spaetzle maker, even before turning the crank. 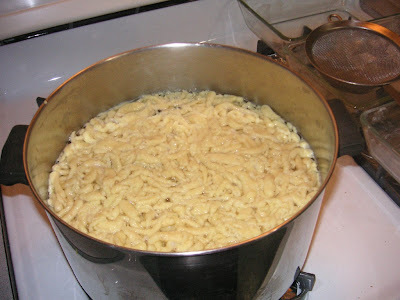 In about two minutes, the cooked spaetzle rise to the top of the boiling water in the stockpot. Using a strainer, collect the spaetzle. Drain them well, and then toss them with the oil in the waiting destination dishes. It is best to make the spaetzle in batches, so that there is room for them to reach the top. With this recipe and a large spaetzle maker, I usually do them in 4 rounds. Serve them any way you would serve a hearty pasta side dish. 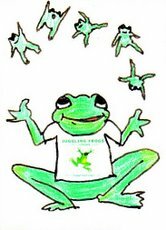 We often serve them under brisket or roast beef. For a dairy dish, we toss them with shredded cheddar cheese and sprinkle with Parmesan cheese. We've been told it is the German take on Macaroni and Cheese. I think so too--there must be some kind of substitute. I wonder where one buys a spaetzle-maker. You don't have to have a spaetzle-maker, that just makes it faster, more uniform, and smaller noodle. It takes a bit longer, but you can do it the old-school way with two eating spoons, table spoon sized. 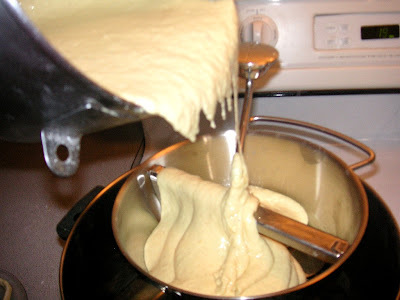 Scoop up some of the batter with one spoon and use the second to push about one quarter to one third of the batter from the first into the boiling water. After you do a few spoonfuls a couple of the noodles will start to float up and you'll have to wait for the batch to all finish cooking and float. Then fish them out with your strainer and start another batch. You'll get larger more irregular noodles, but I think they taste a little better. Add some minced onion and garlic to the batter and the larger spatzle are even more delicious. i've been told a potato ricer is a perfectly fine substitute for a spaetzle-maker. 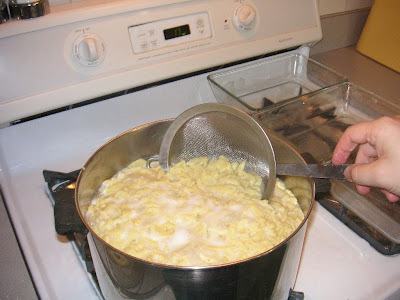 I've been making spaetzle since I was young enough to reach the stove, and we never used a special tool for it. We did buy one once, but we had to make the dough runnier to go through the holes, and they turned out much smaller than we liked. The way I'd recommend to do it is to place a portion of the dough in an ordinary cereal bowl, hold it over the water, and use a table spoon to scrape small dumplings in. It's quite fast once you get used to it. A good tip is to periodically dip the spoon in the boiling water to keep it lubricated, otherwise you'll have to pause now and then to clean dough off the spoon. This method permits you to control the size of the spaetzle a lot better. We like them rather large (7cm by 5cm or so) so that they have a 'meatier' texture. Try it! I have my mother's spaetzle maker, and my 3 children all have one also-- and all know how to make them--schwabish style, not big clumps, nice long skinny ones. Serve them with potroast and gravy, etc. WONDERFUL. I tried this tonight, and it was delicious. I halved your recipe and halved it again, and it was just right for two of us with leftovers. I served it with red cabbage and bratwurst. This was my second time to make spaetzle, but I like your recipe better than my first attempt. I did an experiment tonight which I haven't seen on any food site, so I suppose it wasn't authentic, but the taste was great. Instead of cooking the noodles in boiling water, I cooked them in a watered down beef broth. 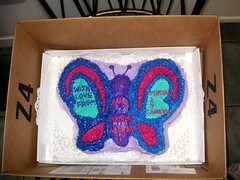 DH loved them! I didn't have a spaetzle maker so I just tilted the bowl over the boiling broth and used a knife to sort of cut noodles as the batter ran over the edge. It worked, although my noodles weren't uniform size. I think with practice I could manage that, though. Concerning the "Macaroni and Cheese" thing: They're called "Kässpätzle" and they're made by putting a layer of Emmentaler or similiar cheese between the batches, mixing it thouroughly and topping it off with roasted onions. To make it more interesting add Limburger or similiar cheese. The spaetzle maker in the photos looks a lot like my food mill - which I should try using for this some time. The ones I have seen that are specifically called a spaetzle maker looked a lot like a heavy duty potato ricer. That said, my friend used to make spaetzle using the batter on a cutting board method. We never used any kind of maker/machine to make this. My grandmother taught me when I was young and we just use a small hand held cutting board and butter knife. 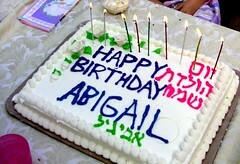 Once you get it down it doesnt that all that long to make them by hand this way. 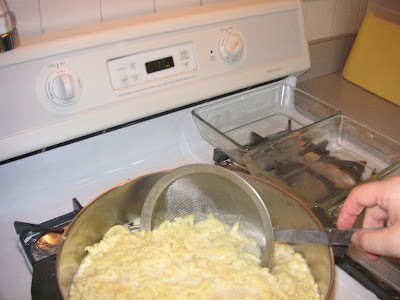 We have always used a strainer to make spaetzle. My family loves burnt butter on them.